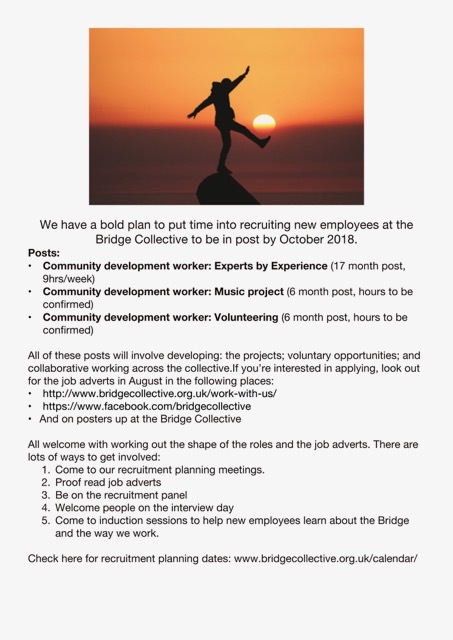 We have a bold plan to put time into recruiting new employees at the Bridge Collective to be in post by October 2018. Come to our recruitment planning meetings. Come to induction sessions to help new employees learn about the Bridge and the way we work. The application window for the 2016 Community Development Worker – Music post has now closed. A letter explaining why you think you are suitable for this post, with reference to the job description and job specification. Your current CV. Please explain any gaps in work history; experiences other than work are valued too.